Raising aquarium fish, both salt water and tropical, can be a profitable hobby or even a new career. This article will give you the steps to follow to be a successful aquarium fish wholesale source for local pet stores and hobbyists. You may even become a nationwide supplier of a particular species of aquarium fish. Take time to evaluate your market. Proper research can make a difference in whether you will turn a profit or not. Start slowly and get a feel for what you are doing. Do the preliminary homework you would do with any start-up business. Raising and wholesaling fish can be rewarding. Evaluate your local or regional market. Talk to small independent pet shop owners. See if there are any fish in high demand that they do not have a reliable source for. Find out if they buy from hobbyists and what there requirements are. Many large chain pet stores will not buy fish except through bulk buying on a national level. ON the other hand, local mom-and-pop businesses often rely on aquarium enthusiasts for many varieties of fish. Some will buy or consign, while a few only give in-store trade credit to small breeders. Make sure you have a market. Evaluate your setup. Are you looking to breed fish in home aquariums or will you be setting up large commercial breeding tanks? Can you raise the type of fish you want to raise profitably? Some fish are very hard to raise in a captive environment. If you can figure out how to be successful breeding a fish that is in demand and not easily available for pet shop owners, you may have a profitable niche. Some common fish are hard to raise profitably in some areas, as your competition might include outfits with large breeding ponds and lakes in warm areas of the country who don't need to heat the water or provide filtration, air pumps or other things that will raise your utility bills. Choose a fish species you want to begin with. Learn all you can about them. Certain fish may survive well in an aquarium environment, yet breed only with exact water temperature changes or changes in pH levels of the water that trigger breeding. 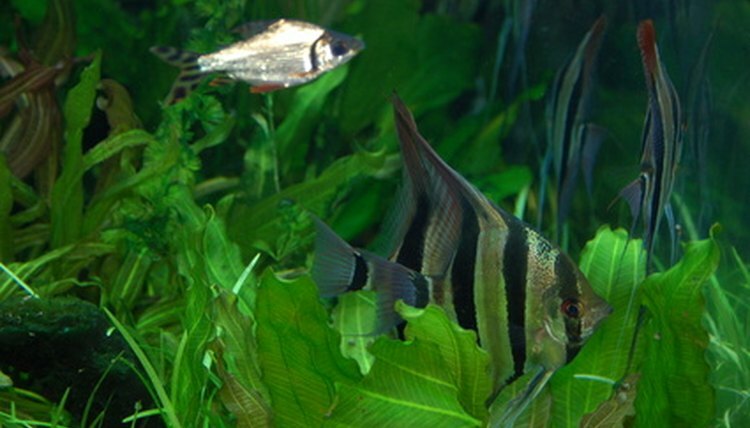 Some aquarium fish that originated in the Amazon river or similar environments only breed when water changes approximate the rainy season's high-water flow that changes water quality and temperature. You will need to create those conditions to get them to breed. Many fish need certain structure or areas to breed. Some are live bearing, like swordtails and guppies. Others lay eggs in gravel, mud or even a bubble nest. New baby fish (fry) will usually have a different diet than adult fish. You need to educate yourself and absorb all the information you can on the species of fish you chose. Learn the economics of the fish breed you have chosen. Some common fish that are easy to raise sell for 99 cents each. You can only wholesale them for half of that or less. Other hard-to-raise fish that have a hobbyist following can sell for fifty dollars each or more. The demand is such that you can wholesale them for close to retail. Determine cost to raise a batch of young fish versus the retail and wholesale prices. Find a successful fish-breeding operation and see if you can interview the owners, or even work for them for a time. Learn all you can. If you can view and research a successful operation you have a better chance to succeed. Perhaps you can establish a joint venture and breed fish for them in your operation, and they can sell what you raise in the channels they already have established. Start a small trial project. Create a tank or pond to raise the fish species you want. Obtain a proven breeding pair or group of fish. Raise a batch of fry. Determine how big they need to grow before they can be sold. Arrange with a buyer to take the first batch of fish when they are ready to sell. Monitor sales and see how big a market that store has. If the store can sell 10 of your fish a day, that store is probably a market for about 50 to 100 new fish a week. If they sell out quickly, you may be able to sell many times more on a regular basis. If it takes 2 to 4 weeks to sell your fist batch of fish, you may not have a good market for your future business—unless they are high dollar fish. Learn how to transport fish without losing any. Some fish transport well. Others need special care to be moved any distance without loss. Oxygen level and temperature will be a concern in shipping.